Thomas Duarte: Playmaker, but as a WR/TE/H-Back? 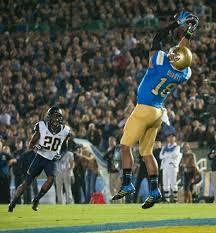 WR/TE-Thomas Duarte, UCLA, 6′ 2″ 231 lbs. Cons: If the former Bruin is going to play tight end in the NFL, he is undersized for the position at 231 lbs. Most NFL tight ends are at least 6′ 3″ and 250 lbs., sure there are exceptions to the rule like Washington’s Jordan Reed to whom Duarte gets compared with a lot (same 40 time and within six pounds of each other). However, I’m not convinced that they share the same physicality. Reed blocks fairly well and can line up as a traditional tight end when needed. The former UCLA rookie rarely lined up inline. He, instead, usually got a free release off the line of scrimmage, which makes me wonder if this tight end can handle the jam. When facing physical coverage, Duarte seemed to wear down and get off his game somewhat. I’m unsure how the athletic rookie will perform with more 50/50 contested catch opportunities than he faced in college. The former Bruin only had twelve 225 lbs. bench reps, which could show a lack of power or less than stellar commitment to training. When he wasn’t involved in a play, there were times Duarte stood around and did not even attempt to misdirect the opposition. Pros: His athleticism and explosion were on full display with his NFL Combine performances: 4.72 40-yard dash, 33.5″ vertical jump, 118″ broad jump, 6.97 second three cone, and 4.24 second 20-yard shuttle. Duarte tracks the ball well in the air, catching it at its highest point (usually out-leaping his coverage) usually in stride. He has loose hips which allow him to change directions quickly and can contort his body to make difficult receptions with his soft hands. The play maker is willing to catch the ball in the middle of the field and usually can box out most defenders in traffic. The former Bruin runs clean routes, uses double moves to get open downfield, and keeps his legs churning until he is on the ground. His ten touchdowns in 2015 attest his ability to get into the end zone. Initial Impressions: Duarte is quite the offensive weapon, but is limited because of where he can be used by an NFL team. If he gets tagged as a tight end by your league software, he could be the best joker tight end in his class. The lack of physicality could be an issue if he doesn’t go to an NFL team that will use him correctly. « Darron Lee: Over-Athletic, Under-Physical?